One for the contrast between the start and end of the weekend. This was a shoot someone else was doing but they didn’t mind me shooting Seb too. 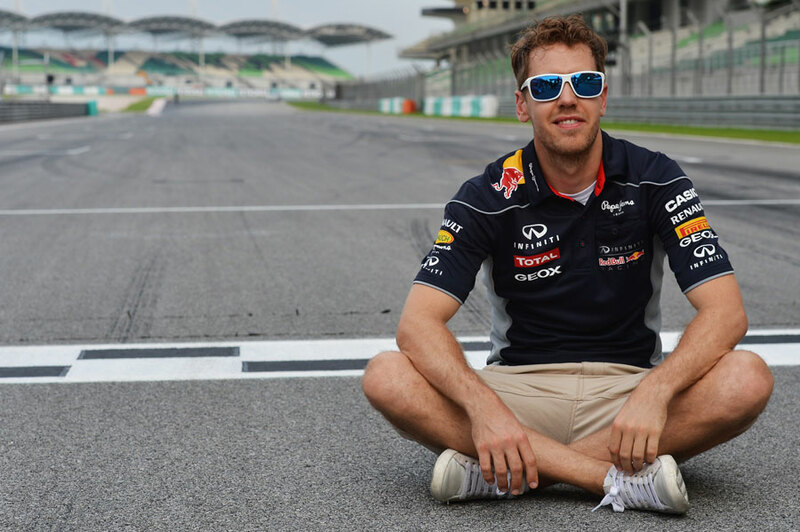 He was just doing his track walk quite late in the evening and he was asked to sit on the track just on the finish line. I guess it’s quite appropriate that he was smiling and relaxed at this point, because it all changed by the end of the race. I got absolutely soaked doing this shot! I’m actually in the rain myself – to get the shot you had to go out in the rain – but it was worth it. 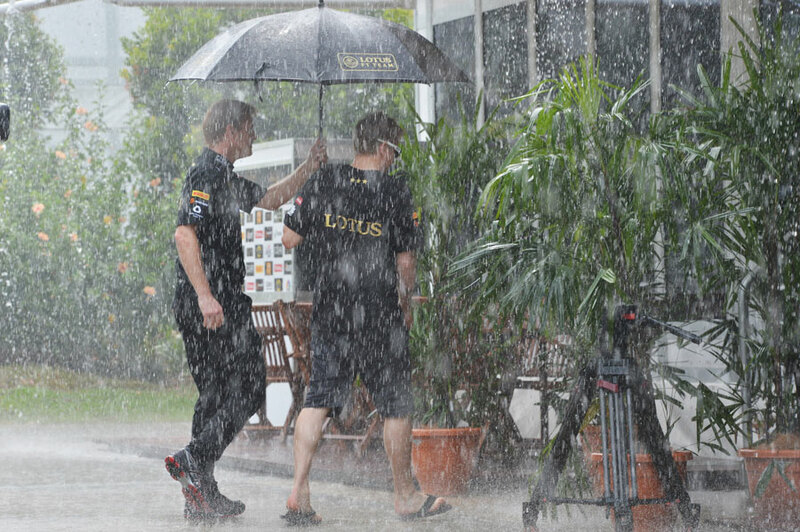 Kimi was returning from the Thursday press conference when a massive shower came down and it’s just literally the 70-200mm out in the paddock and a mass of bouncing rain as it tumbles down. It was quite funny seeing the drivers trying to shelter from it. This is one of my usual locations, and I always get the same photos of cars locking up; because they keep locking up! It’s at the last corner and we’ve got a good vantage point from the grandstand. I only got a few shots before the rain came in again, but it’s just on the 500mm handheld following them in to the corner. The drivers tend to lock up as they turn in because the track’s so wide, and this turn is always a place you know you’ll see it. I must admit I hadn’t seen the damage through the viewfinder – I was just following the car coming round the corner as he didn’t have any grip – but once I looked at the pictures afterwards I saw it. You can see it’s clearly cracked on the right hand side and also how worn the tyres were after just one lap, especially the front left. You’d think he would have come straight in with the damage, but it’s always easier with hindsight. Lewis literally got out the car as Nico was going past and it’s quite a good moment to capture. Nico was very professional about it all as soon as he was out of the car; he could have been ranting and raving but he was very calm and collected. 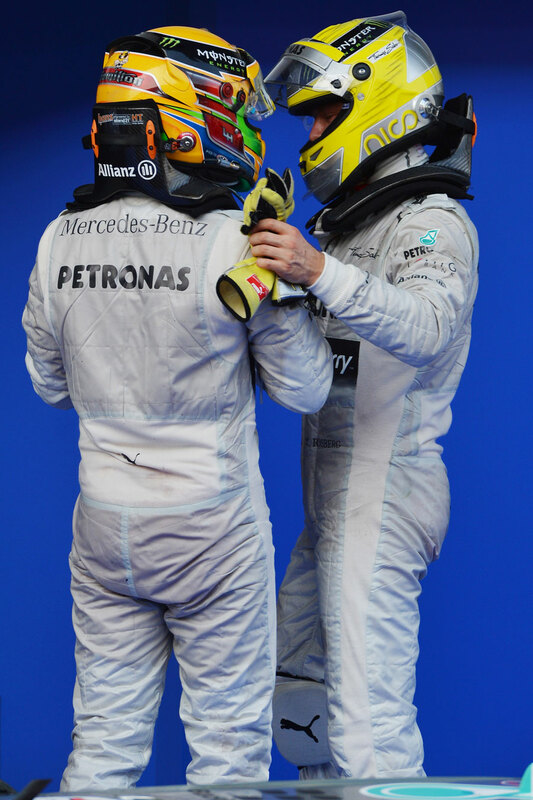 The two of them talked for quite a bit and I was impressed with Nico’s reaction because he was obviously quicker. You can understand the decision though, as you wouldn’t want to risk the chances of them both scoring with it being the home race for Petronas – Mercedes’ title sponsor. Obviously we need to address the real controversy, and we need more than one picture! 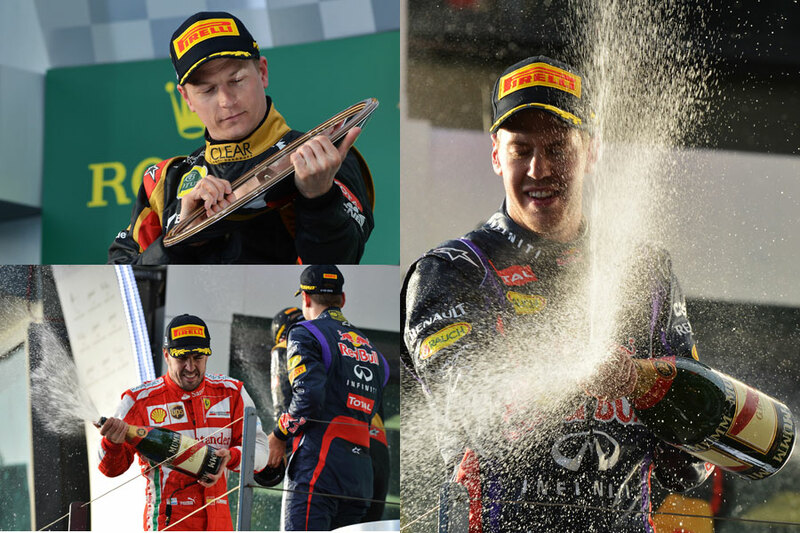 Mark said “Multi 21” to Vettel before the podium, and that’s a setting for the car – the ‘Multi’ switch is on the right hand side of the steering wheel when Seb got out of the car. 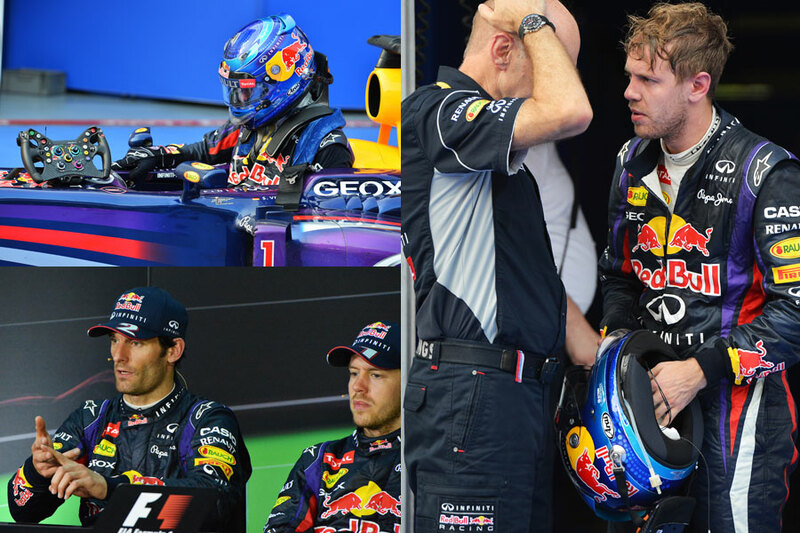 As you can see with the press conference shot there’s a real contrast between Vettel’s demeanour now and at the start of the weekend, and then you can see Newey is feeling pretty uncomfortable ahead of going on the podium with both drivers. 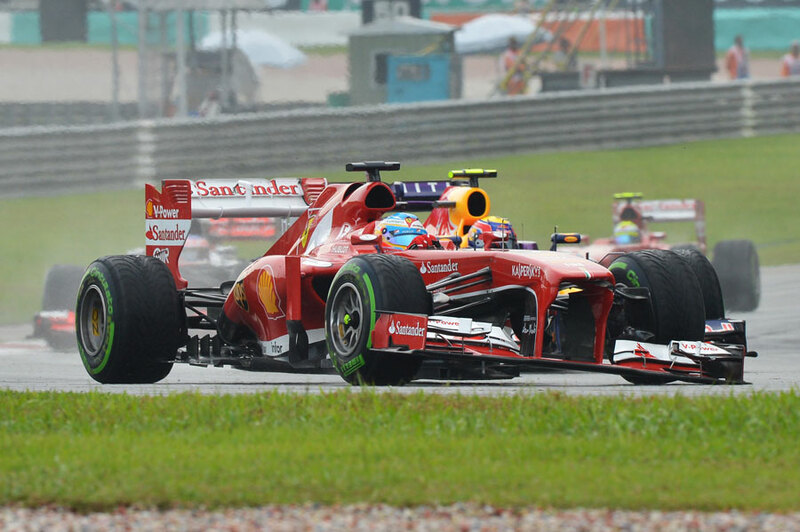 For what it’s worth, I think Red Bull should have been as clear on the radio as Mercedes was and just said to Vettel “don’t overtake” rather than letting him get on with it. 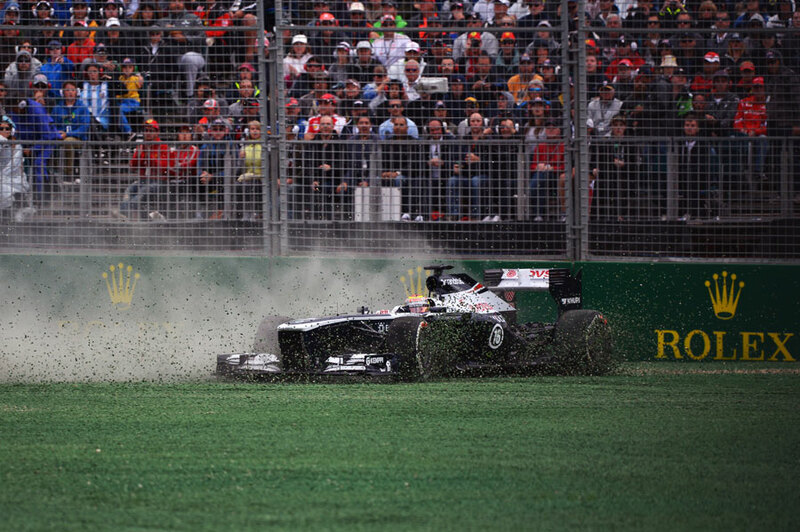 This is how Pastor Maldonado’s race ended on Sunday. 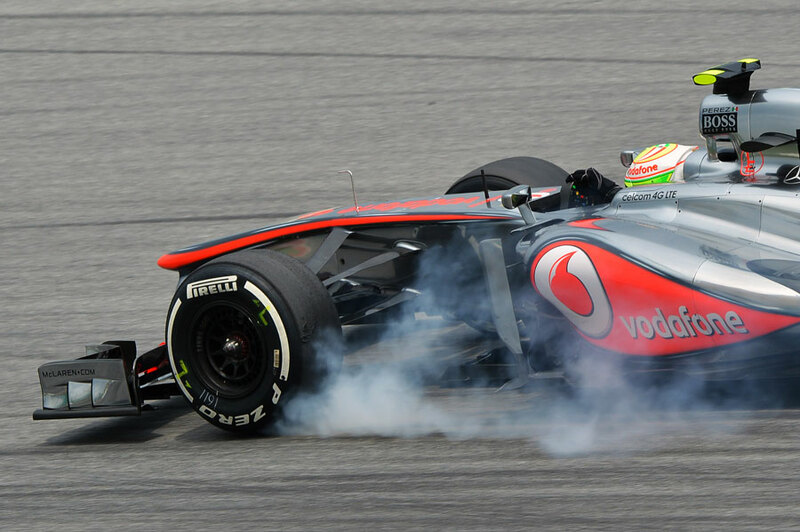 He actually went off twice in the race so maybe he was having problems with his brakes. I saw him go off once so I thought he might go off again and that’s why I ended up with this shot. The reason it’s got a black edge to it is because it’s short through a hole in the fencing with the 500mm lens and as I panned round the edge of the fencing just came into the frame. This is Sir Chris Hoy carrying his own bike into the paddock, which I thought that was quite funny for a Knight of the Realm. Then Sky Sports did a piece with Paul di Resta and Martin Brundle as the they cycled round the track. He had to pump his own tyres up too, but he had this special pump that has the right pressure in it already and he just attaches it to the valve and the tyres are at the right pressure. A lot of drivers ride around the circuit nowadays because the engineers will go out and tell them if anything is different and then they can pick up on it while going round on a bike. They don’t necessarily need to walk it anymore. This shows the entourage that comes with Formula One. You’ve got the press officers on the right, the photographers in the middle and then the TV crews on the left. The TV people can’t get in the middle because all the photographers got there first so they had to go to the side and wait. 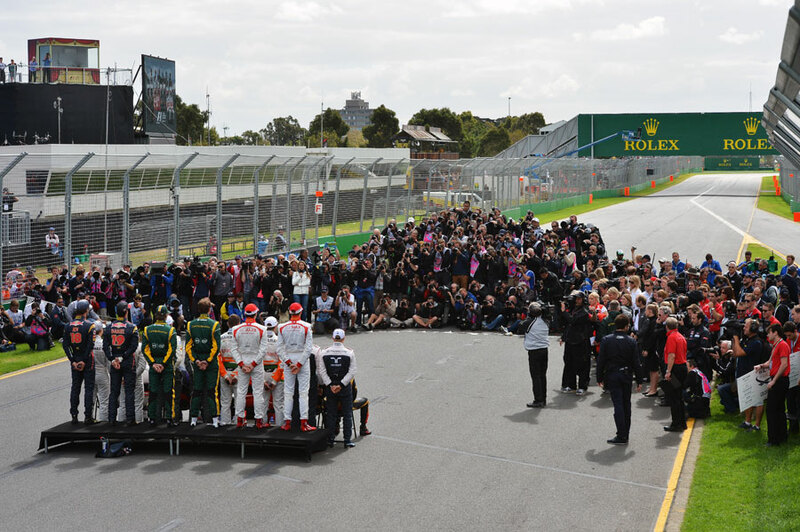 We had two of our snappers in that bank of photographers and my brother Keith was to the side with the press officers, so I took this shot from the start tower to get a different perspective. It’s a nice atmospheric picture. 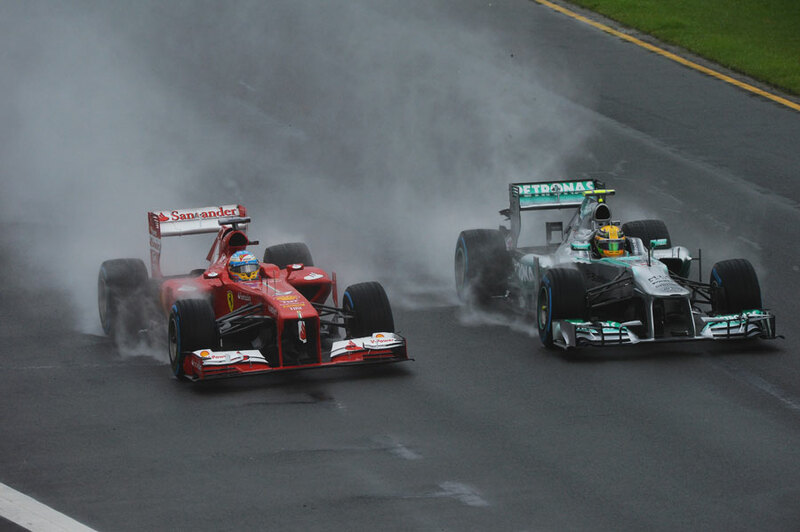 This is Q1 on Saturday and you can see how wet it was. I went up the tower on the main straight and I caught this great moment as Fernando Alonso overtook Lewis Hamilton in the spray. During the rain break I went back and wired my photos so the websites got them nice and early. A lot of photographers stayed out in the rain but I thought it was more important to get some pictures back. 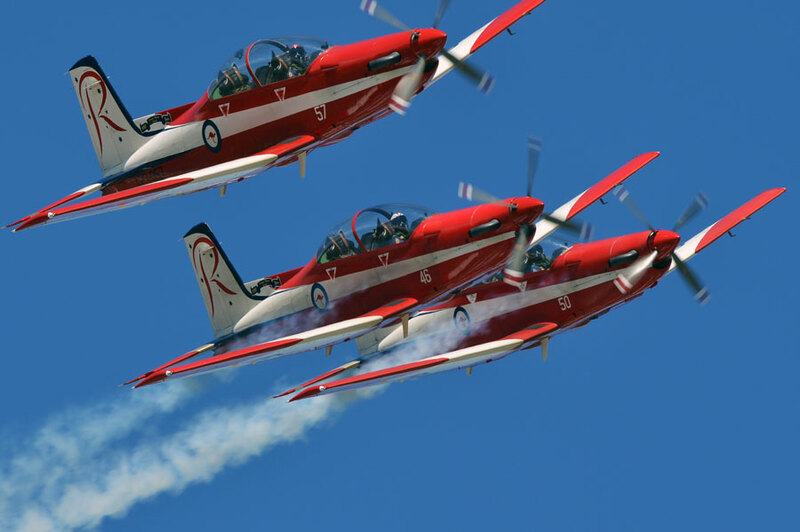 This was taken on the 500mm, handheld as I just followed the Royal Australian Air Force planes through the sky. It was taken before qualifying and you can see that the sky is blue and sunny, but I had some more in the sequence and you could see that the clouds were already starting to come in. Of course it then tipped it down for qualifying and it had to be postponed. It shows how quickly the weather can change in Melbourne.